LONDON--(BUSINESS WIRE)--The global wearable device security market is expected to register a CAGR of close to 13% during the period 2018-2022, according to the latest market research report by Technavio. However, the growth momentum of the market is expected to decelerate due to a decline in the year-over-year growth. A key factor driving the market’s growth is the increased dependence on the Internet. The increase in the use of the Internet for day-to-day activities and critical operations is one of the major drivers contributing to the growth of the market. As the penetration rate of the Internet is increasing in every aspect of people’s lives, they tend to share their personal information on the Internet. Moreover, companies are offering storage services on the cloud, leading to the storage of critical information on the web. This market research report on the global wearable device security market 2018-2022 also provides an analysis of the most important trends expected to impact the market outlook during the forecast period. Technavio predicts an emerging trend as a major factor that has the potential to significantly impact the market and contribute to its growth or decline. Smart wearable devices are used by consumers to monitor their heart rate, body temperature, remote cardiac, and calories burned. These devices help users avoid issues like obesity and heart congestion. In regions such as North America and Western Europe, there was a decline in the cost of these products as the demand for smart wearables increased in the past years, which is a major factor driving the adoption of wearables devices in developed regions. Wearable device can be synchronized with mobile devices that enable the user to monitor sleep patterns and receive calendar alerts about their medical activity. “In hospitals, doctors use smart glasses for diagnosis and treatment and recording patient related information. It allows doctors to capture images and record videos during the examination of patients. Smart glasses software helps to access the patient's electronic health records easily through the integration of the patient's information with hospitals database,” says a senior analyst at Technavio for research on IT security. This market research report segments the global wearable device security market into the following applications (wristwear, headwear, and bodywear) and key regions (the Americas, APAC, and EMEA). The wristwear segment held the largest market share in 2017, accounting for nearly 70% of the market. This application segment is expected to register the highest growth of nearly 4% and dominate the global market by 2022. The Americas held the highest share of the global wearable device security market in 2017, accounting for a market share of approximately 43%. The market share occupied by this region is anticipated to increase during 2018-2022. 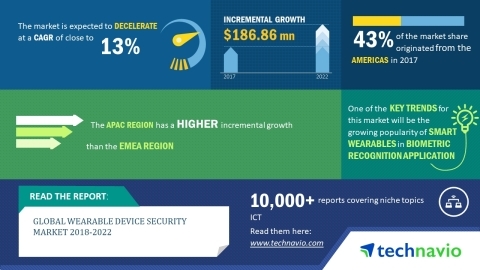 The global wearable device security market is expected to register a CAGR of close to 13% during the period 2018-2022, according to Technavio.